When tragedy strikes, it leaves a wake of devastation for so many family and friends near the situation. How you rebound from those types of life situations can tell a lot about someone’s character and values. Today’s featured band went through an awful lot at a time when their success was at an all-time high. Despite that, they have been able to forge ahead, and keep belting out southern rock standards to this day. In 1967 a group of buddies from Jacksonville, Florida got together and started a band. Since they practiced regularly at home, their band was named My Backyard. Realizing that was a bit ‘small time,’ they went through various names before landing on Leonard Skinnerd, a mocking tribute to their PE teacher Leonard Skinner. He was a strict enforcer, with one of the band members even quitting school because of his rules. Around 1970, the spelling was changed to the distinctive Lynyrd Skynyrd—and the revolution was born. They were quickly the top bands in Jacksonville, headlining local shows. After some lineup tweaks and hiring a manager, the band felt poised for a major breakout. In 1972, they were heard by Blood, Sweat & Tears front man Al Kooper. He thought their sound was so outstanding; he took a demo directly to his label, MCA Records. Skynyrd was immediately signed and started making a record. Their debut album came out in 1973 and coincidentally, is one of my favorite albums in music history. The record and subsequent tour was such a huge success, they got started on their second album right away. 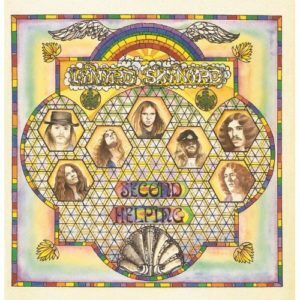 Second Helping was released in April of 1974, not even a year after the successful debut. There were serious doubts the band could follow it up, so the critics were looking for any reason to shoot it down. But helped perhaps by the band’s most signature single “Sweet Home Alabama,” the album would reach #12 on the charts and sell two million copies in the U.S. alone. Soon, Skynyrd was invited to headline music festivals all across the world and they were one of the most recognized bands of the mid-‘70s. They ended up releasing five albums in their first five years, maintaining the buzz, but it all ended on October 20th, 1977. After a show in South Carolina, the band’s chartered airplane crashed on the way to Baton Rouge. Six people were killed on impact, including lead singer Ronnie Van Zant and guitarist Steve Gaines. At that point, the band would go on permanent hiatus. Where do you start with an absolute legendary band like Lynyrd Skynyrd? Their debut was “Free Bird,” “Simple Man” and “Tuesday’s Gone”—three absolute rock staples to this day. And you follow that up with a monster track like “Sweet Home Alabama”—so popular it’s used in stadiums around the world, including the preferred track of the Crimson Tide for obvious reasons. Their mix of southern rock and blues is often imitated but never duplicated. When a Skynyrd tune comes on the radio, you have no doubt who it is. It’s so rare for a band’s first two albums to be unanimously reviewed as worthy of five stars and also be considered top albums of all time. Around 1987, younger brother Johnny Van Zant took over the vocals and got the band back together. While just a couple founding members still play, the band has a very similar feel live to what they did back in the ‘70s. “Free Bird” in many ways has become a tribute to the deceased in the plane crash, a track they always play. Rolling Stone says they are one of the top 100 bands of all time and they were inducted into the hall of fame in 2005. Give Second Helping a go today—for $5 bucks, that’s some real southern hospitality. With these guys and the Allman Brothers Band, Southern Rock really flourished in the 70s. Allman Bros are another great group. Very different sound compared to Skynyrd, but unmistakable nonetheless. It’s great to hear bands like them that hold up so well to modern day standards. That’s a great measure of true music talent. Thanks for the comment!